So many people resolve to lose weight for the new year but by the third week of January they've already accepted that they're actually just going to pack on a few more cuddly layers of poundage for the winter instead. What happened during those three weeks? Diets don't work. No one has ever gotten happier or felt better as a result of depriving themselves of food. Also, research shows that diets don't lead to long-term weight loss. Why? Restrictive eating (dieting) causes stress. Stress causes your body to go into survival mode. Survival mode means your metabolism slows and your body stores more of the food you eat as fat. The good news is there's an alternative to diets. There's love- the most fabulous four letter word of all time! Love absolutely causes people to be happy, feel better, and reach and maintain their natural weight. When I reflect on my upcoming 21 Day Souper Awesome Vegan Soup Challenge, a challenge to eat one bowl of homemade vegan soup every day for 21 days, love stands out. It's not just me. When I tell people about the challenge, they usually reply with, "I love soup!" This soup challenge is an opportunity to love yourself up for 21 days. 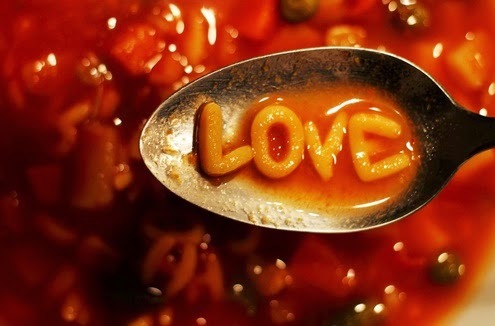 If we were voting for a food to be the love mascot, I think soup would win. By eating soup during this challenge, you'll warm your body on the chilliest days of the year. By choosing these healthy soups that are nutrient dense and free of processed ingredients, you'll give your body what it needs to operate happily and give your digestive system a little break from figuring out what to do with junk food. Cooking is love and cooking nourishing foods you enjoy for yourself is the ultimate act of self-love! During this challenge, you'll let your intuition guide you by creatively tweaking recipes to suit your personal preferences and cravings for adventure. You'll reduce stress by preparing simple recipes that are really forgiving of the mistakes made by novice and distracted cooks. And if you make a little mistake with a recipe you'll have an opportunity to express compassion and forgiveness with yourself for things not going the way you felt they should. Participating in this soup challenge also means you'll have lots of leftovers. Leftovers are key to getting the leverage you need to enjoy the best of life so I like to call them "bestovers". No more eating crap food because you're hungry and there's nothing healthy and tasty in the fridge or pantry. Bestovers also mean you'll pack lunch and avoid having to get takeout for dinner. Bestovers save you money and time that you can spend on the things you love and with the people you love. Do you usually go out to lunch on workdays? Assuming you spend 15 minutes picking it up and $10 for each meal, you'll save 3 hours 45 minutes and $150 just during this challenge, which covers 15 weekdays. What would you do with an extra 4 hours and $150? During this challenge, I'll provide you with practical tools for connecting your mind, body, and spirit while you enjoy preparing and eating these soups. Making this connection is key to loving your life and your body. If you actually use them, these tools will help you reduce cravings, end overeating, end emotional eating, lose weight for good, and feel happier. Wanna lose weight this winter without dieting? Join my 21 Day Souper Awesome Vegan Soup Challenge! Sign up here.